A teenage boy had just passed his driving test and asked his father when he could start driving the car. His father said, "You bring your grades up from a C to a B average, study your Bible a little, and get your hair cut. Then we'll talk about the car.” The boy thought about this for a moment and then agreed to his father’s proposal. The Dad replied, "Did you also notice they walked everywhere they went?” At least the son was thinking, like a lawyer trying to win a case. However, the Dad’s response was even better. He was the judge…case dismissed. We humans tend to do what that son did, find an easy way around what we know we should do. And that’s a problem. We look for a technicality to substantiate where we want to go. That’s a problem too. It’s a distraction from the necessary action bringing satisfaction. Making wise decisions should be challenging. If something doesn’t challenge you, it doesn’t change you. Here’s the problem summed up in Ecclesiastes 8:11 written by King Solomon. “Because the sentence against evil deeds is so long in coming, people generally think they can get by with murder.” People thinking they can get away with murder has been going on since the beginning of human history. Why do they do this? There are no grave consequences immediately so why shouldn’t they? Too many of us give up our tomorrows to today’s self-gratification. One unwise incident or event can turn into a decade of unwise incidents and events. As the scripture says, it takes time, time to catch up. But when time does it comes like a mighty locomotive full steam ahead. It passes you like your standing still. The judge overtook the lawyer. The problem is whatever hits the fan will not be evenly distributed. The truth is, we don’t always have our best interests in mind. The truth also is when we say no to today’s destructive intention, we say yes to tomorrow’s better future. Let’s get some wisdom. Let’s learn how to make decisions that lengthen the quality and many times the quantity of our lives. Though no one can go back and make a brand new beginning, everyone can start from now and make a brand new ending. Do you know what the greatest decision-making question ever asked is? Here’s the answer, “Is it wise?” Not, “Is it legal?” Lawyers do that. They, like that boy, look for a loophole in the law. Wise people ask, “Is what I am doing now in my life wise considering my past, present, and future?” All the options may be legal, but more importantly, are the options wise. Most times expedient, impulsive, self-gratifying decisions are not wise They come back to meet you sooner or later. 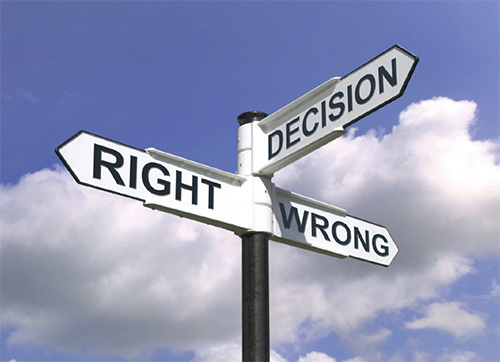 Author Andy Stanley gives us some practical wisdom on wise decision making. He encourages us to ask three questions: Knowing my history and past, is this a wise thing to do? Knowing my current reality, is this a wise thing to do? Knowing my future goals and vision, is this a wise thing to do? There is a heap of wisdom in Stanley’s advice. Here’s a few examples. If my background is severe alcoholism, is drinking for me wise? If I don’t have extra money right now, is buying this new premium carpet wise? If I am lazy and don’t study, could this affect the scholarship I’m applying for at the university? Where do you want to go at this stage in your life? What’s your vision? Your personal vision is often the catalyst for wise decisions. If we really think about it, the decisions you make don’t make you, they reveal what’s in you that either breaks or makes you.